The most versatile back support we have seen in 30 years. Whether the chair you have to sit on is soft and sagging, as upright as a church pew, or even a bench against a wall, Backfriend will provide comfort and support. Can even be used for reading in bed. 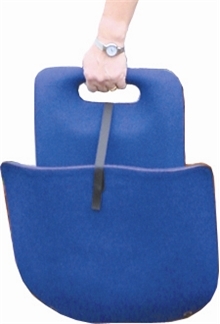 Beautifully designed back rest and seat base can be used in most any seat or chair. Firm anatomic contour allows freedom of movement and excellent support while avoiding pressure points. Doctor recommended. The finest back support available. Lightweight and foldable with built-in carry handle. Height adjustable backrest for a custom fit. 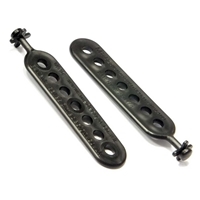 Firm support for both the lumbar and thoracic spine. Shaped seat base prevents slouching. 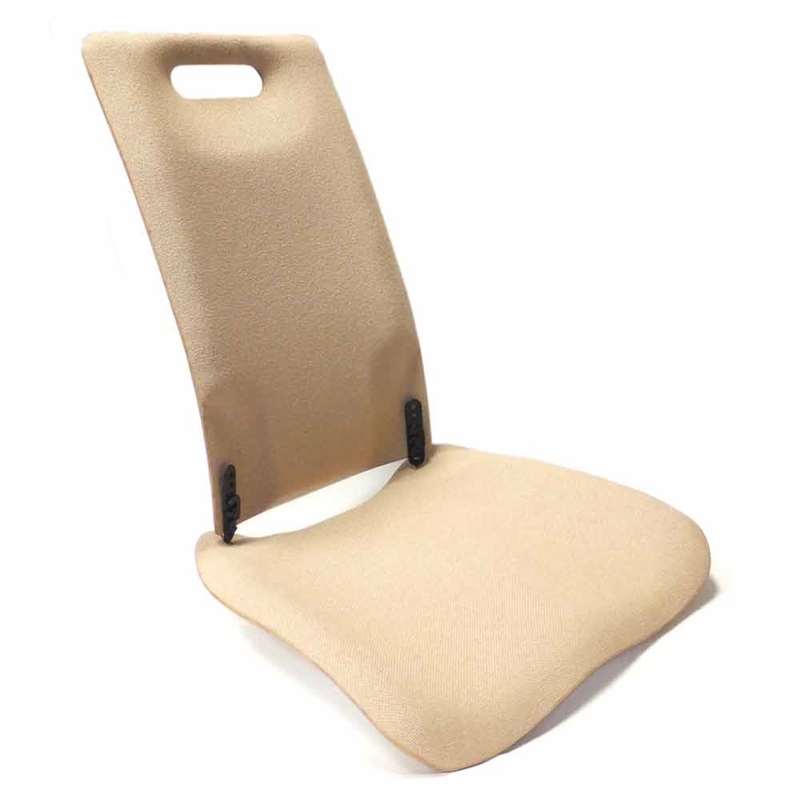 Top quality fire-resistant foam and fabric upholstered over a resin frame. We recommend the single-padded model for most users. Double padding can mask the anatomical contour and make the seat less comfortable for some. In addition, taller users may find that the extra height of the double-padded seat causes their head to hit the roof in some vehicles. Single-padded seat: 1" padding on the seat and backrest. Recommended for most users. Double-padded seat: 2" padding on the seat; 1" padding on the backrest. Recommended for wheelchair users and those who prefer less seat contour. CMHR foam meets UK Furniture and Furnishings (Fire) (Safety) Regulations 1988. S.I. No. 1324, Schedule 1, Part I; BS.5852, Part 2. Fabric is inherently fire resistant and meets UK BS EN 1021 - 1:2006 (cigarette), BS EN 1021 - 2:2006 (match), BS 7176 : 2007 Low Hazard, UNI 8456 + UNI 9174 Classe 1, NF - P - 92 - 507 M1, DIN 4102 B1. This is a VERY FIRM back support. Even the double-padded model is VERY FIRM. 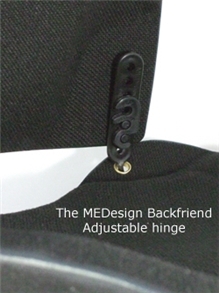 Fits mild and average lumbar lordosis spinal shapes. Not recommended for people with a deep lumbar lordosis or very thick thighs. 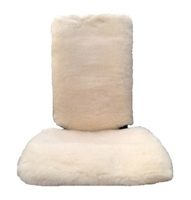 Set the backrest height where it is most comfortable. The factory setting is appropriate for the majority of users. We suggest you try this height until you are sure adjustment is needed. Maximum body weight 260 lbs. 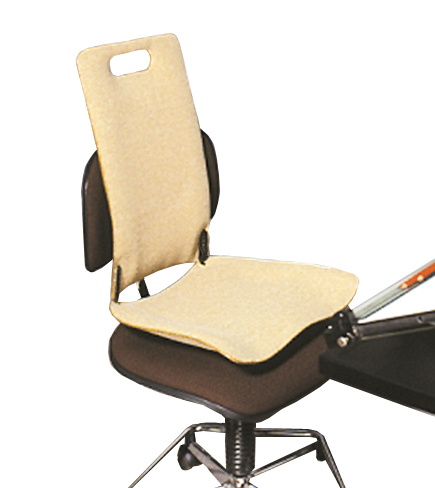 For maximum comfort, recline the backrest 15°- 20° or more. 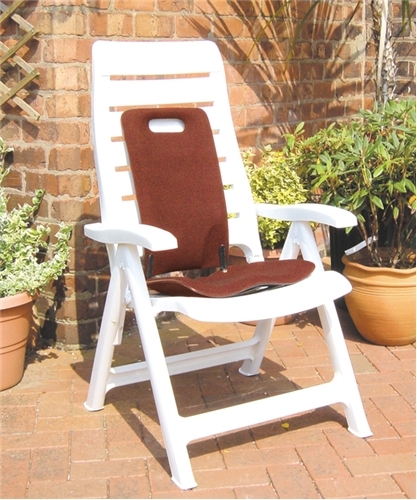 If used in a reclined position, raise the front of the seat base slightly to maintain your position. Your thighs should be well supported by the seat base. 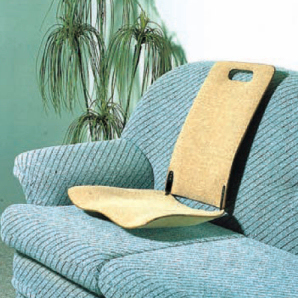 If your chair is too low, raise it with seat cushions. If your seat is too high, use a footrest. Not recommended for power wheelchairs or scooters. Not recommended for tall people in cars. 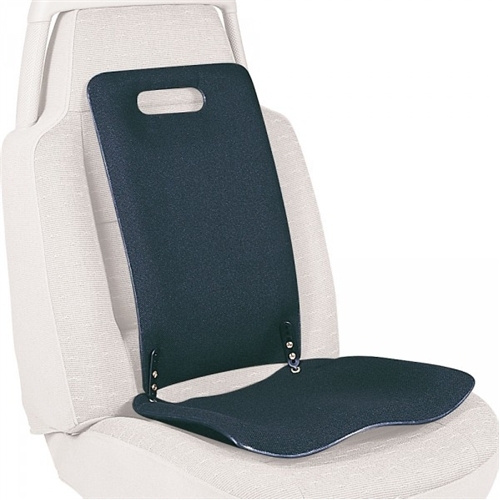 The firm seat raises the body higher in a car seat. Good if you are short, but if you are tall your head will touch the roof. 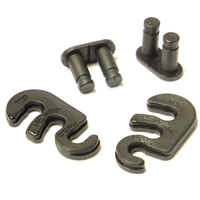 While the support structure itself is very durable, the hinges and velcro closure require periodic replacement under heavy use. Remove minor stains with a damp cloth or sponge. Major cleaning is best done with a dry foam cleaner of the type used for car upholstery. Do not carry a wallet in your back pocket when using the BackFriend. The trouser fabric may wear against the hinges. Some initial wear may occur on the bottom corners if there is friction on the seat base. 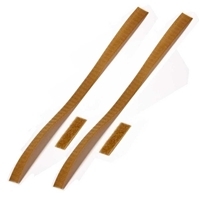 Forcing the Backfriend into too narrow a space or knocking the edges against hard surfaces may damage the edge seal. Ships in 1-3 business days from Novato, California.